View your favorite, subscribed, and waitlist events. View your purchases and registrations. 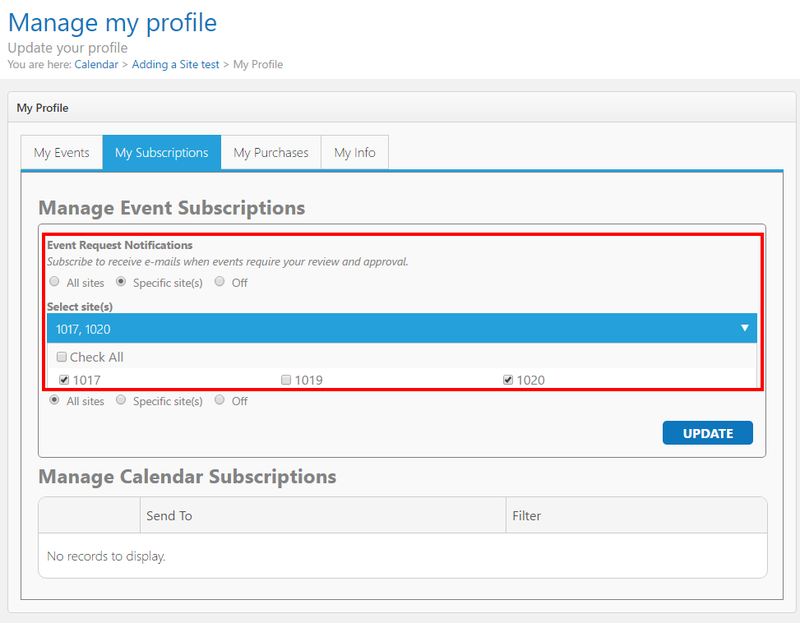 View and manage your event subscriptions. Change your information, or reset your password. When logging into the calendar site as a visitor profile (or account with a "viewer" role) you will be navigated to the "My Profile" Page by default. When logging into the calendar site as an account with author or administrator roles you can click the drop-down arrow to the right of your name in the header navigation on the top of the page. Doing so will open a drop down menu, with one of the options being "My Profile". When logged into the application and viewing events on the calendar's "front end" (the public facing calendar) in the header navigation on the top of the page there is a link, "My Profile". Clicking on "My Profile" option will navigate to the "My Profile Page". Your profile is used to log into the application, as well as view and manage your favorite events, event alerts, purchases, and waitlists. On the My Profile page you can edit your profile information, including your first name, last name, email, phone number, and password. In this list, all upcoming events that you have used your profile to register for will be displayed. When viewing an event's details you have the option to add the event to your favorites. This will keep the event in your profile for easy viewing here. Occasionally, items will be sold out when browsing events on the calendar site. You have the option to "Join Waitlist" for events to be contacted if more items become available. If you use your profile during the confirmation process you can view your history of wait listed events and items in this area. Event Name: The name of the event that was being viewed when you joined the waitlist. Item: The name of the item that was added to the waitlist. 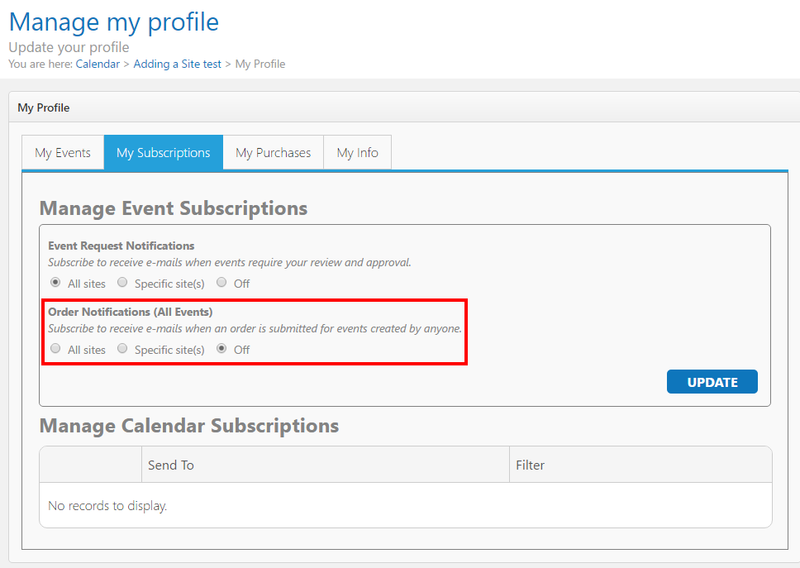 When browsing events on the calendar site you can use your email address to subscribe to alerts for added or modified events. If the email address that you used is associated to a profile you can manage and view your alerts in this area. All Sites: When selected, the administrator will receive all event request notifications from all sites in the collection (tenant) where the user is either an administrator, or has the site event approver permission. Specific Sites: When selected, a new drop down will appear on the page, allowing you to select from a list of calendar sites. If a calendar site has been selected, and you have the appropriate permissions, you will receive event request notifications for that site. Off: When selected, the administrator will not receive any publishing notifications. Any events added to the site will not be approved until the administrator logs into the pending events area to view if any have been submitted. Selecting this option may result in a delay of processing new event submission. Administrators receive an email each time a purchase or registration is completed for an event published to the site. This setting allows you to select if you would like to stop receiving these messages, or select which calendar sites you will recieve notification messages from. Three radio options are available. All Sites: When selected, the administrator will receive all purchase notifications from all sites in the collection (tenant) where the user is either an administrator, or has the site event approver permission. Specific Sites: When selected, a new drop down will appear on the page, allowing you to select from a list of calendar sites. If a calendar site has been selected, and you have the appropriate permissions, you will receive event purchase notifications for that site. Off: When selected, the administrator will not receive any order notifications. Send To: The Email address that will receive alerts for events that meet the criteria in the filter. Filter: The criteria that must be met to trigger an alert to the email address in the "Send To" field. 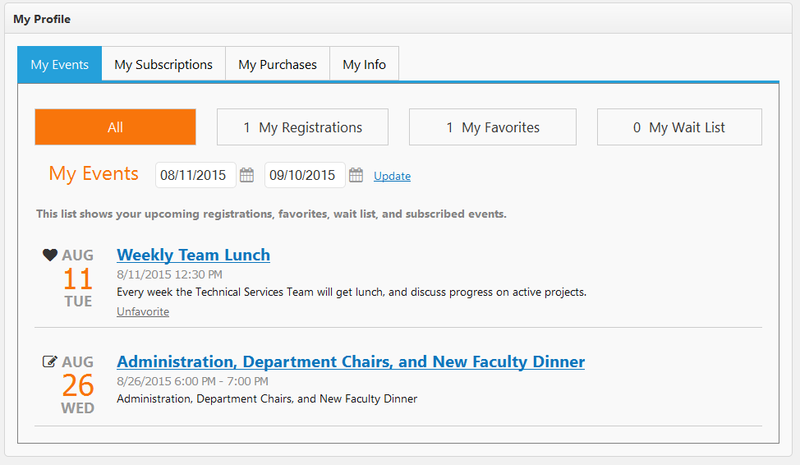 When browsing events on the calendar site you can use your profile when purchasing items or registering for an event. If you use your profile during the checkout or confirmation process you can view your history of purchases in this area. Item Type: The product type associated to the item that you purchased. Item Name: The name of the item that was purchased. Item Cost: The cost of the item without discounts. Discount Amount: The dollar amount (value) of the discount used for that item. Total Cost: The total dollar amount charged for the item, calculated at item cost less discount amount. First Name: A text field that indicates the first name of the person associated to this profile. Last Name: A text field that indicates the last name of the person associated to this profile. Email: The email address currently associated with the profile. Note: Your email is the ID used when logging into the application. Any and all changes made to the email field will change how you log into the calendar application. Phone: A text field that indicates the contact number of the person associated to this profile. Phone Extension: A text field that allows to specify the contact phone extension number of the person associated to this profile. Current Password: Enter your current password in this field. New Password: Enter the new password that you would like to use moving forward. Click the "Update" button to apply your changes and save your new password. Click the "Cancel" button to discard your changes and return to the landing page. When creating subscriptions to calendar sites that are private (require login) this token is used to authorize an external system (RSS reader, Google Calendar, Outlook Calendar) to check the calendar for updates. Please note: Changing your private token will break any existing subscriptions that you have created. You will need to re-create these feeds via the subscribe links on the front end of the calendar.